Venture to the mountain kingdom of Bhutan, where change is on the horizon. 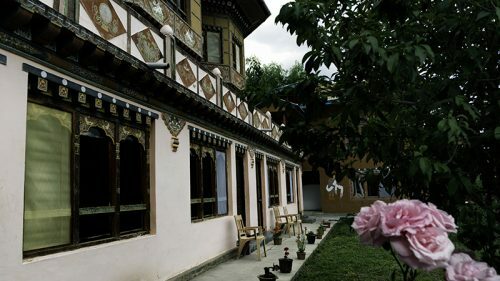 Few foreigners ever step foot in Bhutan’s small villages and stunning Buddhist monasteries – not until 1974 did the country open its borders to tourism. Now, Bhutan is developing rapidly. At our Center in Paro, you’ll explore the challenges of protecting biodiversity and maintaining traditional rural lifestyles in this time of transition. Study conservation and environmental issues firsthand against a backdrop of vibrant culture and Buddhist philosophy. Learn more about the famed principles of Gross National Happiness, gain an in-depth knowledge of local ecosystems, and wrap up the semester with an extensive field research project. This academically rigorous program follows a six-day/week schedule. 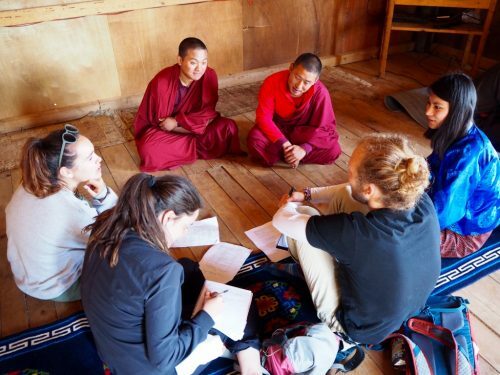 The interdisciplinary curriculum is designed to help students actively discover and understand the complexities of environmental, social, and economic issues in Bhutan. On the Himalayan Environment and Society in Transition program, you will take three 4-credit disciplinary courses, one 2-credit religion and culture course, and a 4-credit capstone Directed Research course. Courses are participatory in nature and are designed to foster inquiry and active learning. Each course combines lectures, field exercises, assignments, tests, and research. All courses are taught in English. This course allows students to develop a conceptual and practical understanding of religious principles that underlie Bhutanese attitudes and approaches to environment. Students learn the basic principles of Buddhism and other religions practiced in the region and look for religion in the landscape and in society. Students look at religion and environment, culture and environment, and Bhutanese attitudes toward environment, and get some language training in Dzongkha. This course focuses on the dynamics among people, society, and environment. We explore this dynamic through the interdisciplinary lens of political ecology, examining the political, economic, and social factors of environmental issues and changes. The course provides a conceptual framework for understanding how nature-society interactions—such as agriculture, natural resource management, biodiversity conservation, and rural development—shape both the natural landscape and the social and economic conditions in Bhutan. Students also gain the practical skills and tools to critically examine and assess the human-environment nexus in the field. This course considers the suite of natural resources that are tied to both local livelihoods and the national economy— including arable soils, water, timber, non-timber forest products, and grasslands. Students study the livestock and agriculture systems of Bhutan, both historical and current, and understand why and how these are changing, and what the implications are for household economies, the environment, and national issues. Students consider the important topic of food security, at both the household and national levels. 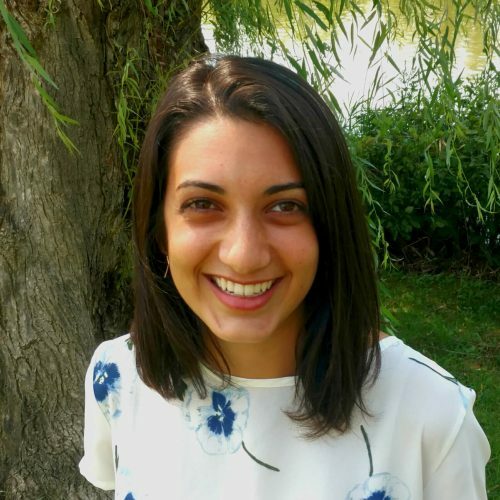 By integrating field and classroom approaches, students explore the science behind current local and global issues in natural resource management, food production, biodiversity, and climate change. This course provides a theoretical and practical understanding of the ecology of the Eastern Himalaya region. Students explore the physical features influencing mountain ecosystems, including the geology and hydrology, elevation, climate, and weather. The course highlights the unique characteristics of the flora and fauna found in these ecosystems, and the threats to these species. Students are exposed to an array of ecosystems—some in natural states, some heavily modified by people. Rivers, forests, and farmland are examined in various locations and along different altitude gradients, showcasing the ecological diversity within this small mountain state. You will gain practical skills in the field such as: remote sensing and mapping, species identification and distribution mapping, biodiversity surveys, research design and implementation, camera trapping and mist netting, quantitative and qualitative data collection and analysis, protected areas assessment, and research presentation. 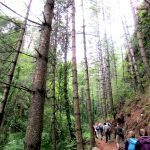 You will visit different ecosystems and communities, which may include mountain ecosystems, subalpine conifer forests, alpine meadows, rural villages and small towns, subtropical broadleaf forests, high-altitude mountain passes, monasteries and sacred sites, and agricultural communities. The Center is located at one end of the stunning Paro Valley, at the base of a towering ridgeline dotted with Buddhist monasteries. Campus is a small cluster of buildings designed in the traditional Bhutanese architectural style. A pleasant 10-minute walk brings you to the markets, shops, and cultural events of Paro Town. Click on the icons below to learn more about our Center in Bhutan.